A very good powerful and tensiony pinch climb out of the steep on fantastic pinches. I was trying to make climbs in the steep and was having trouble making climbs that could actually be done. But then I saw this amazing line which actually worked out to be V9, so I named it the Doable climb because unlike most stuff I was trying that day, it was actually doable. 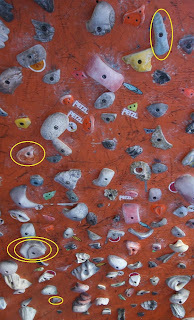 A really amazingly obvious line of pinches, strange I had not seen it before, here is the video: http://vimeo.com/7118084 for the finish you are supposed to do a fun little come in to the Bubble Wrap Tufa Pinch, and then match, slipped in the video, oh well. I will give one picture of the start to be clear but then it is pretty easy to follow from orange E-Grips mini jug, to blue Water Tufa, to pink Water Tufa, to Bubble Wrap Tufa Pinch, into Epic Taped ETCH pinch to the black ringer jug far out right.